I’ve told stories at Garnett the last two weeks to paint pictures of people who display various Spiritual Gifts in their lives and by them build up the church and share the love of God with unbelievers. Ron Marcinko is a friend who I know from Nashville who I believe Jesus Christ gifted with faith. Ron and his wife, Gidget, have graciously allowed me to ask them a lot of questions about their lives, stay with them in their trailer at the “Gloryland Trailer Park” in Nashville. I could tell you a hundred stories about Ron and likely will in the future in different ways, but I’ll tell you one story. 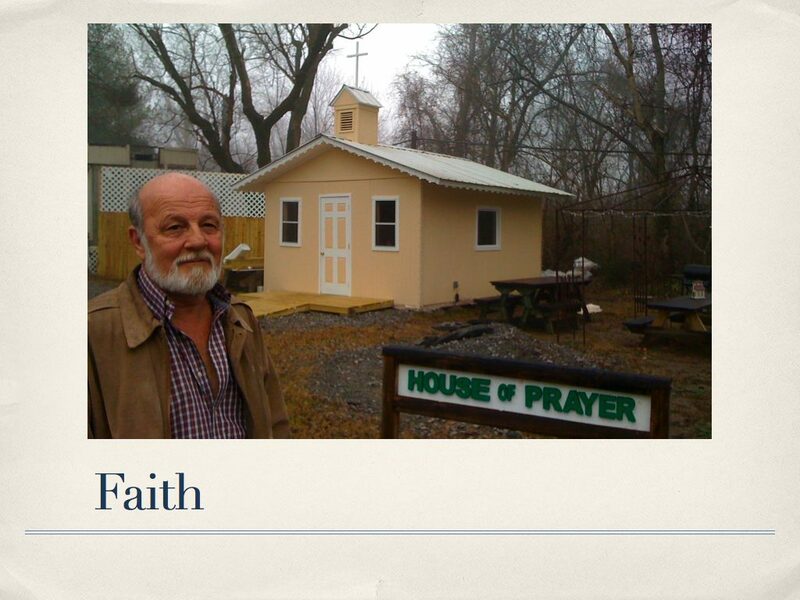 Ron says God told him to build a house of prayer. For years he resisted God but he kept getting messages from God that confirmed that he should build the house of prayer. No, he didn’t want to build a church. God was calling him to build a place of prayer for his neighbors. This small sanctuary could be used anytime for Ron’s neighbors to come and pray. Each Sunday he meets with anyone willing to come where they pray and sing and hear the word preached. He lines up preachers from various churches around Nashville to come and preach. He build the house of prayer when he developed cataracts in his eyes, and he was virtually blind. This did not deter him, neither did the money it would take to build it. God provided through many people who love and believe in Ron like I do, and he was able to get the materials gradually to build and finish the house of prayer by Christmas 2009. How did he complete it when he was blind? Gidget learned how to use a nail gun and helped him build. Thank you to Ron and Gidget, people who both have incredible gifts from the Lord. I believe Jesus has given Ron the gift of faith. A few times each year I take a Sunday and visit another church. Loy Johnson was kind enough to preach in my place last Sunday while I visited my home church, Dewey Church of Christ. The top features of a great church do not begin with a great preacher or programs. What matters is “faith expressing itself in love” of God and neighbor.